I’m going to take these two films in opposite order of how I saw them, in part because I have less to say about Foxcatcher, a film I feel both fascinated in and detached from. Certainly, this is one of the most controlled cinematic exercises of the year, cold, delicate, and sparse from start to finish. The dark, still photography is frequently haunting, and the amount of space Miller leaves on the soundtrack is a huge part of what makes the film’s frigid atmosphere so immersive and all-encompassing. Silence is, in fact, the film’s main weapon; music is almost nonexistent, sound effects are minimal, and dialogue is much less important than physicality. Each of the three leads – Channing Tatum, Steve Carell, and Mark Ruffalo – have constructed their characters almost entirely around physical presence, and the majority of the drama, for me at least, lies in observing how each person holds themselves, either alone or with others, and how that physicality evolves and shifts over the course of the narrative. ‘Observational’ is indeed the key mode of the picture, for in telling the story of eccentric millionaire John du Pont and his relationship with professional wrestlers Mark and Dave Schultz – which culminated in du Pont murdering Dave in an unexpected act of violence – Miller is less interested in overarching character progressions, or even clear themes, as he is in studying the strange, tortured relationships at the film’s core. Du Pont (Carell), the last member of a longstanding American dynasty, has an eerie need for control, to own things and exert power over them, and what he appears to want most, at the start of the film, is world-famous wrestler Dave Schultz (Ruffalo), and the prospect for Olympic glory that comes with him. Du Pont cannot get Dave, though, so he goes through Dave’s younger brother, Mark (Tatum), who, while a talented wrestler in his own right, has always lived in his sibling’s shadow. Du Pont gives Mark exactly what he wants – respect and recognition – and Mark, while unable to bring Dave along to Du Pont’s Foxcatcher estate, gives Du Pont the submissive object of control the millionaire seems to compulsively desire. For the first half, Foxcatcher is essentially a two-hander between Carell and Tatum, and it is absolutely transfixing to watch the quiet exchange of power between the two characters. Mark is utterly consumed by the allure of du Pont’s encouragement, and du Pont feeds on Mark’s vulnerability like an expert predator, twisting the knife further and further until Mark’s identity has become deeply, dangerously sublimated. Carell, eerily portraying du Pont’s latent madness under an unsettling subterfuge of high-minded, manipulative oratory (and an astonishing layer of makeup and prosthetics), proves what I have been saying about the actor for years: That he is accomplished a dramatist as he is a comedian. Indeed, the core of what makes his work so compelling here is the same thing that made him great as Michael Scott on The Office: His ability to unflinchingly push towards the awkward and cringe-worthy, with utter commitment and a total lack of fear. Tatum, meanwhile, is all physicality, holding himself like a big, hulking ape, with every thought and emotion worn plainly on his body. It is a stunningly controlled performance, and when Tatum and Carell share the screen, sparks absolutely fly. There is a sequence, near the halfway point, where du Pont and Mark share a helicopter on the way to a formal event, in which du Pont introduces his pupil to the ways of both cocaine and speechifying (“Ornithologist, philatelist, philanthropist…”), that is among the most accomplished and effective individual sequences of 2014. The film’s second half broadens its focus, becoming much more of a disturbing ‘love triangle’ between the three central characters, and focusing on the individual relationships each of them share. Du Pont and Mark have a falling out; du Pont finally gets his claws on Dave, only to find that he cannot possess this man the way he can Mark; and Dave swoops in to become a redemptive figure for Mark, helping to build his brother back up after du Pont so thoroughly tore him down. The film is no less rich or chilling in contrasting these different pairings, though it does feel slightly messier the longer it goes; Mark, so clearly the central protagonist for much of the film’s run-time, is a marginal presence during the last half-hour, and the last act lacks a clear unifying perspective. This may not be a bad thing, though; there is something to be said for Miller’s commitment to following these relationships as they develop, even if that means letting a major character gradually disappear from the picture, and I respect his refusal to offer a clear denouement or punctuation point on the story. Foxcatcher is not about ‘resolution,’ nor is it necessarily about any concrete ‘meaning.’ It simply takes a complicated, challenging story, follows it to the climax, and then ends. Things feel a bit dramatically empty by the time the endgame rolls around, with the psyche of each character illustrated so clearly (or, in the case of du Pont, so clearly unknowable) that the finale is practically obligatory. That may, indeed, be the point. Foxcatcher is a study of extreme human behavior, and in the case of a man like du Pont, who wants a kind of control that cannot realistically exist, the only ‘logical’ path is one of forcefully erasing the reality that haunts him. 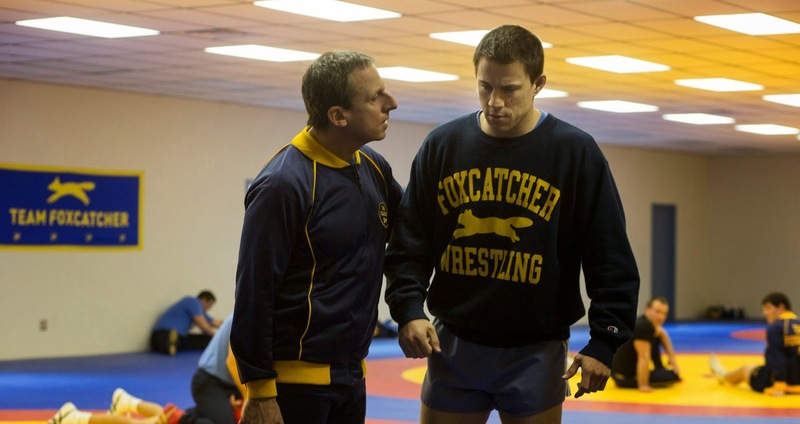 There is no absolution, no overarching message at the end of the path – only the ambiguity of human nature, and if that makes Foxcatcher a difficult film to enjoy or engage with, it also makes it a fairly accomplished portrait of a challenging subject. At the very least, I cannot imagine anyone else telling this story in this specific way, and that alone makes Foxcatcher feel vital, even as I have no desire to revisit the film any time soon. Where Foxcatcher left me feeling cold and detached (possibly by design), I am still recovering from the positively euphoric high of Whiplash, a good five days after walking out of the screening, dazed and elated. Forgive me if I gush, but my praise for this movie has been steadily building ever since seeing it. There have been a surprising number of good blockbusters this year, action, superhero, and science-fiction films that left me thrilled and excited, but no movie I have seen in 2014 made me as constantly tense and exhilarated as this one. 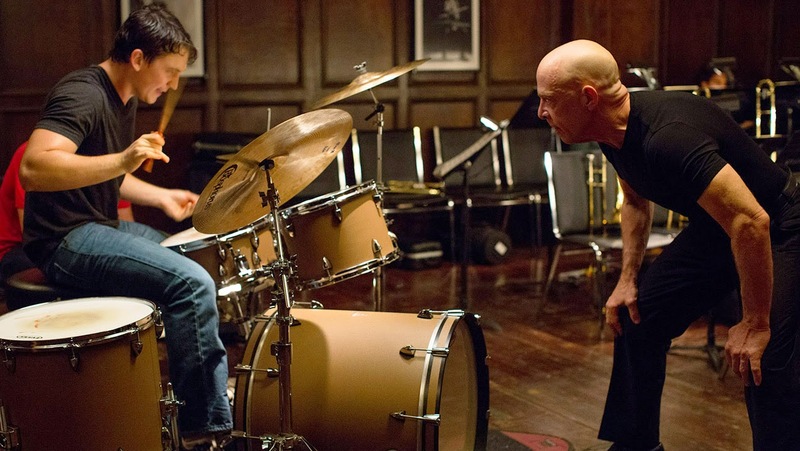 That should not be possible, given the film’s theoretically ‘quaint’ subject matter – the relationship between an aspiring Jazz drummer and his esteemed conductor at a prestigious Conservatory – but beat after beat, sequence after sequence, Whiplash filled me with excited anticipation, pushed me towards the edge of my seat, and then continually upped the ante until I felt I could barely it. Every single sequence is a masterclass in the building of stakes, the creation of tension, and the expertly protracted employment of pay-off – and they are all, at the core, built around the performance of music. Amazing does not even begin to describe it. What makes the film work so beautifully is the dramatically clear (yet thematically complex) nature of the central relationship. Andrew (Miles Teller) is a talented young drummer, dedicated and hardworking, who aspires to greatness. 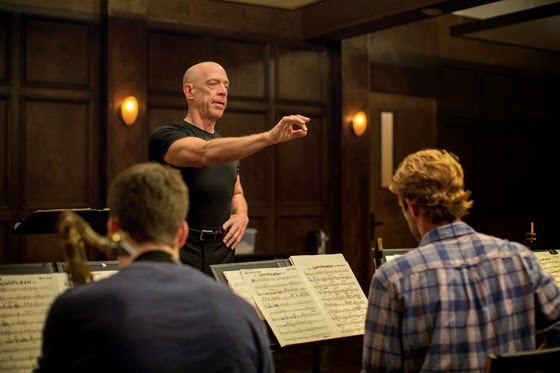 Fletcher (J.K. Simmons) is a famous, highly selective conductor, who aspires to perfection, and pushes his students as far as he possibly can in pursuit of it, to the point of nonstop verbal (and sometimes physical) abuse. From the moment Andrew enters Fletcher’s orbit, Fletcher positively tortures the boy in the name of pushing him further and further, and what makes the film fascinating is how the power dynamics work between them. Fletcher is a monster, pure and simple, but Andrew has no obligation to stick with him; the film’s first few major ‘set-pieces’ (what else can I call them?) are built around Fletcher pushing another student to their breaking point, and just like those students, Andrew could walk away after the initial abuse. Once he sees what Fletcher is, he could leave at any time. But he doesn’t. No matter how much Fletcher throws at Andrew (literally and figuratively), Andrew just doubles down, practicing harder and shedding more from his life. Andrew continually goes as far as Fletcher demands – mutilating his hands, even, to keep tempo on the most demanding piece – and in the process, becomes a better and better drummer. What are we to make of a relationship like this? There are no easy answers whatsoever to what goes on between Fletcher and Andrew. It would be easy to call Fletcher the villain, a callous abuser with no heart and no conscience, but that would be ignoring how complicit Andrew is in his own suffering. Is becoming a better musician worth the cost Andrew puts himself through? Do the results of Fletcher’s instruction justify his heinous methods? Fletcher’s argument – that the all-time great musicians would never have pushed past basic human limits if they were patted on the back and reassured (“there are no two words in the English language more harmful than ‘good job’”) – has a disturbing air of truth to it, which makes us ask: Is perfection worth the cost? Whiplash is a study into obsession, a film about the pursuit of greatness and the toll it takes on the human spirit, and it would be downright haunting – if it weren’t so damn exhilarating to watch. This is where Whiplash soars. The film is constructed as a series of confrontations between Fletcher and Andrew, a high-stakes challenge met by a no-holds barred attempt to clear expectations, and every time Andrew sits down at his drum kit, it feels like Rocky entering the ring. Over and over, writer/director Damien Chazelle establishes an impossible, harrowing situation, in which the weight and difficult of what Andrew must achieve is immense, and then immerses us in the execution of Andrew’s trial. The film is wonderfully shot and powerfully edited; rather than having us spectate musical performances from the traditional proscenium view, Chazelle puts us right in the thick of things, with a variety of angles amidst the band, and even more on and around Andrew’s drum kit. Each shot is expertly chosen and each cut perfectly timed to create maximum impact, and I have no way to describe each major sequence except with the language of an action film. These are thrilling, stomach-churning set pieces, each one more complex and rewarding than the last, and watching Andrew attempt to rise to Fletcher’s demands, time and time again, is easily the most ‘excited’ I have felt in a theatre all year. Even when the film appears to slow down, with a third act that feels disappointingly conventional for a decent chunk of time, Chazelle defies expectations and brings things back to dynamic, unpredictable territory, with a dazzling finale that is impossibly invigorating and impactful. 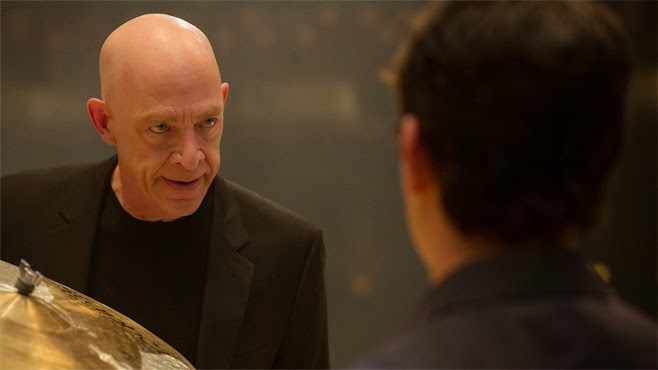 No conclusion to any film this year packs more of a punch than Whiplash, as the final confrontation between Andrew and Fletcher plays out wordlessly, entirely through music, and ends on the exact right note to leave the viewer exiting the theatre in a dizzy, exuberant trance. For all the time I spend complaining about films that should have ended a few minutes earlier, films that nearly had a perfect ending before taking a step too far, Whiplash is my new go-to role model. This is how you end a film – with a powerful, uncompromising wallop, one that says all it needs to say through action, and which leaves the viewer to pick up the pieces and feel the buzz. Pure kinetic energy – that is what Whiplash achieves, and it is wonderful for it. And the performances. My God, the performances. J.K. Simmons has been a big part of my film-going life for as long as I have been reviewing movies – Spider-Man 2 was the first film I reviewed, 10 years ago – and I cannot explain how good it felt to finally see a filmmaker fully unleash this man’s genius in a story tailor-made for it. Simmons has always been a wonderful character actor, with a terrific wit and sharp bite, and Fletcher is, by design, the best role he could ever have. Chazelle gives him these long, positively poetic strings of insults and profanity to recite, and Simmons digs into them like they are Shakespeare; words are Fletcher’s most deadly weapons, and he hurls them at people like daggers. Nobody does this kind of thing better than Simmons (which is why he was so perfect for J. Jonah Jameson), but Whiplash also reinforces what a great physical presence he is, how much he can suggest through body language and facial movements. This is just a tremendous performance, the driving force of the film, really, and it would be ridiculous for anyone else to win the Best Supporting Actor Oscar. Simmons is so attention-grabbing that it would be easy to overlook the work Miles Teller is doing here, but that would be a mistake. Teller first and foremost imbues the character with a sense of authenticity, not only nailing the physicality of a drummer, but also coming across like a genuine college kid, awkward and unsure of himself. Teller establishes that relatable human baseline early on, so that when things get crazy, and Andrew becomes nearly unrecognizable in his pursuit of perfection, it’s all grounded in identifiable emotions and character traits. He inhabits this character beautifully, and there is also something to be said for holding one’s own against an actor as forceful and magnetic as Simmons. This is a real, masterful two-hander, from start to finish, and the exchange that goes on between these two actors is nothing short of magical. My Top 10 list is still very much in flux – as is my Top 30, actually – and with at least 10 more films on my list to see before the end of the year, I have no real sense of what will and will not be on those lists when they finally publish. But I think Foxcatcher has a real shot of breaking the Top 30, and if Whiplash doesn’t find a place on my Top 10, I would be rather stunned. Few films have left me so elated this year, and fewer still have stuck with me in the way Whiplash has. I recommend both, though if you have to pick one, Whiplash is absolutely essential viewing.